The COMSATS Institute of Information Technology - or CIIT for short - is a young university in the public-sector of Pakistan. Founded in April 1998, CIIT was originally a training institution offering certificate courses in information technology, It soon established a solid reputation and opted to offer formal degree programmes also. Subsequently, in August 2000, the federal government accorded CIIT the charter to award degrees. This is the main building at the Islamabad campus of CIIT at Plot 30 in Sector H-8/1. It houses the Rector's Office, the library, computer and engineering Labs, lecture halls and the offices of some most members. Later in 2006, some departments will be shifted to the new (and very large) CIIT campus which is presently under construction in the Chuk Shehzad suburb of Islamabad. The Mission Statement of CIIT reads as follows: "The COMSATS Institute of Information Technology, founded in the belief that understanding enriches all people, is dedicated to the search for truth through advancement of learning and extending the frontiers of knowledge; to the sharing of this knowledge through education in an academically diverse range of disciplines and subjects; and to the application of this knowledge to benefit the people of Pakistan, in particular, the Muslim Ummah and the World at large". Essentially, CIIT seeks to engage in teaching and learning, to promote research and discovery, and to provide services to the public- and private-sectors. It meets its funding requirements through the tuition fees paid by students and from development grants which are provided to it by the Federal Government of Pakistan. The President of Pakistan, General Pervez Musharraf, is the Patron of CIIT, and the Federal Minister for Science and Technology is its Chancellor. CIIT's policy affairs are handled by a Board of Governors comprising eminent officials, scientists, non-governmental organizations and representatives from industry. The day-to-day affairs are handled by its Rector, Dr. S. M. Junaid Zaidi. CIIT offers a number of programmes at both the undergraduate and graduate levels. All programmes, however, are not offered at all its five campuses. 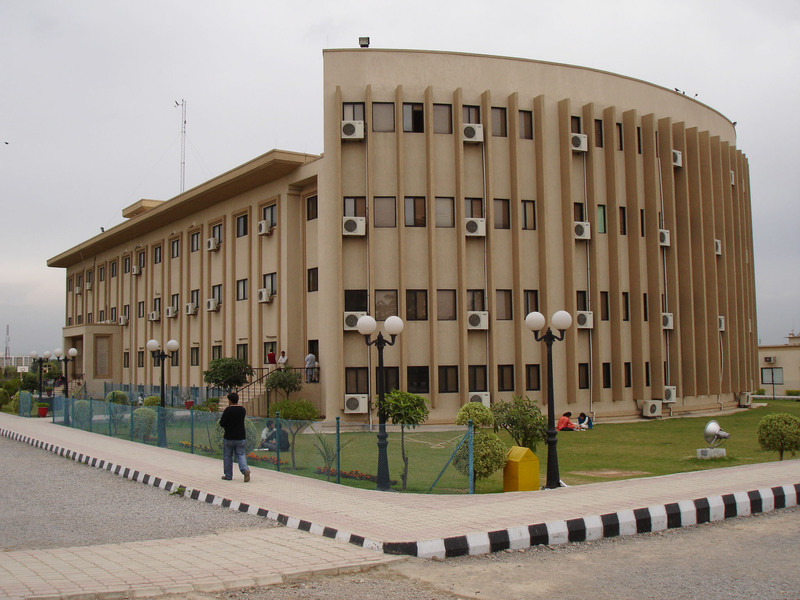 The main campus in Islamabad, for instance, does not offer either undergraduate or graduate programmes in chemical or electronics engineering, while the campuses in Attock and Wah offer only two and three undergraduate programmes respectively. The Abbotabad campus is the only one which offers all three graduate level programmes. The duration of the undergraduate and graduate programmes are four and two years respectively. The required number of credit hours ranges from 135-150 for undergraduate programmes and is approx-imately 70 hours for the graduate programmes. The curricula in management science at CIIT is comparable in standard to that of any reputed western university. CIIT presently has a combined staff strength of about 800 in five categories: Professors, Associate Professors, Assistant Professors, Lecturers, and Research Associates. 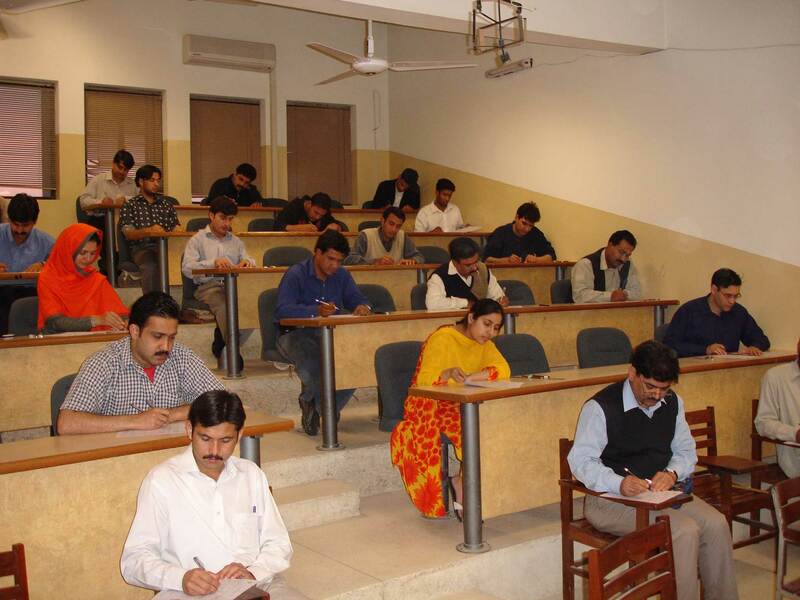 CIIT has the highest number of PhD holders of any academic institution in Pakistan, many of whom are foreign qualified and quite experienced and reputed in their respective fields. Scores of research papers and publications in journals of international repute have been written by CIIT faculty members. CIIT has some great facilities to offer its faculty members. As a faculty member, I have benefitted alot from the digital library which provides access to several thousand indexed articles in numerous scientific journals of international acclaim, and which can be downloaded free of cost at a mouseclick. Many universities in advanced countries do not offer free on-line access to so many scientific resources! CIIT's internet access is very fast, downloading mega-files in minutes. All faculty members are provided a PC with a printer and all needed software, plus prompt support from the IT (Information Technology) section in the occasional event that its assistance is needed. Most importantly though, the salary is adequate and the working atmosphere is pleasant :=) Periodically, we meet in Room 203 where we are treated to a lunch hosted by a group of colleagues on a rotating basis. The department of management sciences accords great importance to teamwork and full cooperation between its faculty members. Time and circumstances permitting, my colleagues visit my office to find out how I'm doing, and vice versa. Such meetings ensure a needed exchange of information about new developments in the department and those affecting CIIT as a whole. Particularly enjoyable are those personal occasions like birthdays when colleagues come to sit and chat, bringing along with them a cake or a box of sweets. 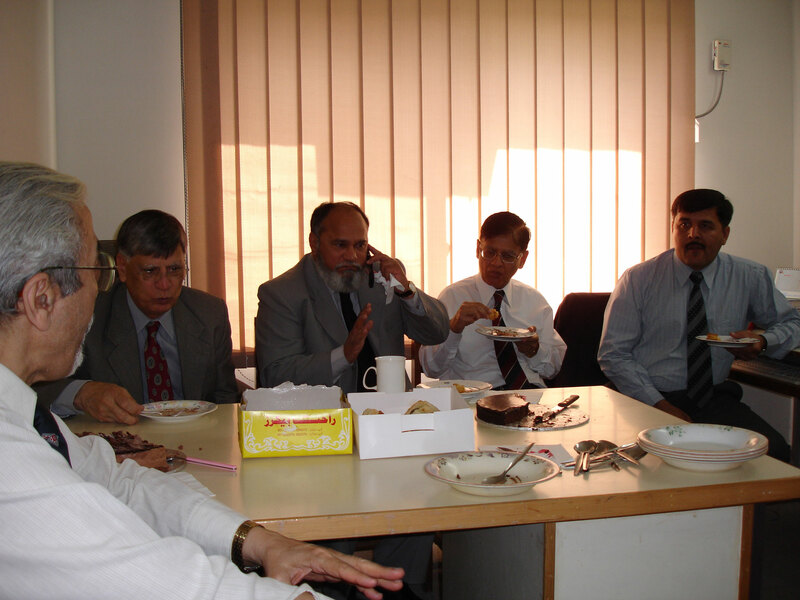 I have celebrated two birthdays at CIIT now, both of which fell on working days, the last one on March 28th, 2006, which was attended by my Head of Department, Dr. Qaisar Abbas, my Dean, Dr. Muzaffer Ali Qureshi, my colleague from Egypt, Dr. Mohammad Nasr (standing to my left in the white shirt in the enlargeable photo on the right), our CIIT advisor Mr. Javid Zafar (who shared my office space), my esteemed neighbour and CIIT advisor Mr. Sarfraz "Henry VIII" Pirzada, and my other colleagues Ms. Zehra "KJ" Sayyed and Mr. Mazhar Habib (standing to my left with folded hands). 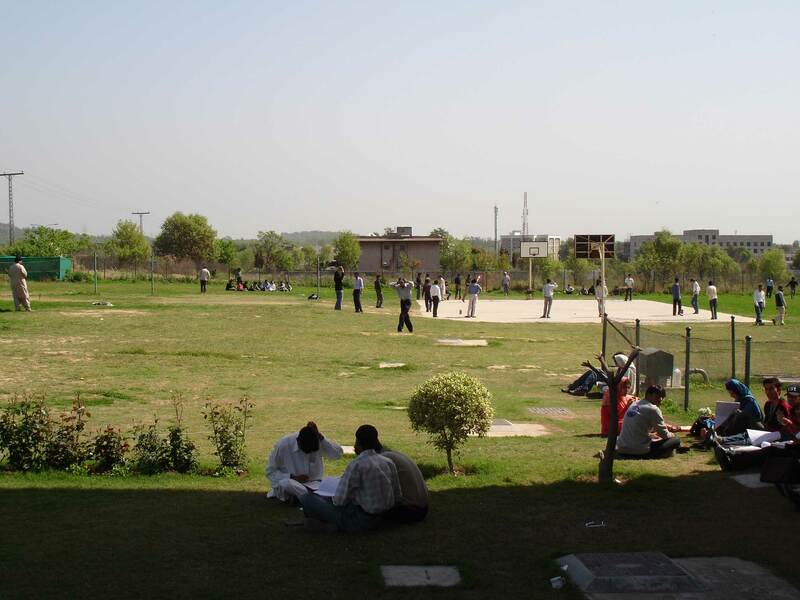 Apart from providing a high-quality education which ranks amongst the better ones presently being offered by Pakistani universities, and which may shortly be strengthened by joint degree courses implemented in cooperation with some reputed western universities, CIIT offers its students several services and facilities. For example, CIIT has several computer laboratories equipped with modern PCS, advanced software programmes and high-speed internet access, like the one depicted in the enlargeable photo on the left, which are used throughout the day by students from all departments. 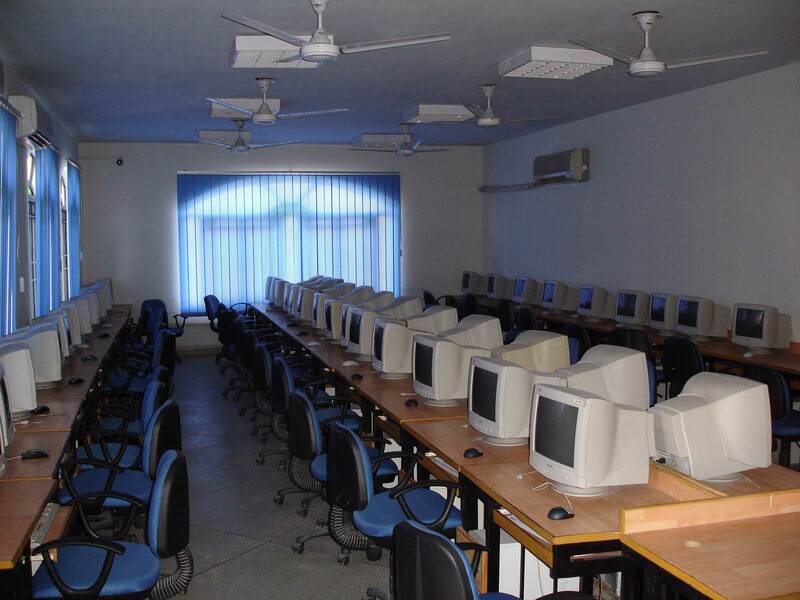 Classes and practical work sessions are conducted here. CIIT provides dormitory facilities for students coming from distant locations (and which are seperated strictly according to gender), photocopying and binding services, and maintains a bookshop and a cafeteria offering snacks, food and drinks at subsidized prices. Being a Muslim country, there is an on-campus mosque. 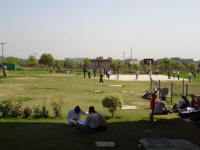 For recreation, there are a number of playgrounds (see enlargeable photo on the right) where students are usually to be seen playing the national sport cricket and where I sometimes get the impression that our youngsters seem to spend more time on these fields than they should for their intellectual good. I just wish some of the students in my class would take their studies as seriously! By the way our department of management sciences has an extensive network of contacts to Pakistani business and industry, as well as foreign companies operating in Pakistan, and offers placement and internship services for graduates and students. Promoting linkages between academia and industry must be an essential element of any management science programme and CIIT - and particularly my colleague and coordinator with business and industry, Nasir "Doctor Proctor" Jamal, is doing a tremendous job in this regard. I joined CIIT as an Assistant Professor in the Department of Management Sciences on March 7th, 2005. Approaching the end of my contract, I can look back with satisfaction at my work and achievements here these past almost two years. My first assignment in Spring Semester 2005 was to teach an MS/PhD class project management. 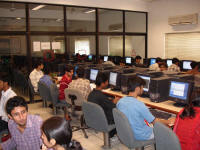 Class was every Wednesday, from 6.00 - 9.00 PM, and comprised eleven male and female students. I invested many hours and considerable mental and physical effort in preparing those classes. Everything had to be done from scratch - from developing the course curriculum, to designing the large number of PowerPoint slides I presented my students with, to reading through all the mandatory project assignments I gave them, to setting their midterm and final examinations. It was a stimulating experience for me (and probably for my students too, most of whom, I'm happy to say, performed very satisfactorily in this course). In appreciation of my committed effort and interest in them, the entir e class invited me at the end of the semester to tea at the Islamabad Hotel (formerly Holiday Inn) after the semester. Click on the enlargeable photo on the left , which I'm afraid, wasn't scanned in too well by me. My student Hakim Ali Talpur, the one who took the photo, is not on it. In Fall Semester 2005, my work load increased significantly. In addition to my project management teaching assignment for the MS/PhD class, I was assigned two additional courses for students in our MBA programme (Business Research Methods, International Human Resource Management). This put considerable pressure on me to design an appropriate programme for the two MBA courses. I set my mind to it and performed well. My students learned a lot from me and I also benefitted considerably from their thought-provoking questions and the interaction I had with them in class. In the Spring Semester 2006, I again taught project management to two MBA classes, one in the day, the other in the evening, each with around 30-35 students. In addition, I taught a smaller MS/PhD class Total Quality Management, a subject of immense practical relevance, particularly in an emerging economy like Pakistan. The courses went well, some disciplinary problems in the MBA day class notwithstanding. The enlargeable photo on the right was taken at the first sessional examination of the evening MBA project management class, which was held in one of our lecture halls. It shows only about half the class (the other half being seated on the lecture hall's left side). All of CIIT's lecture halls are designed on these lines, have approximately equal seating capacity, and are fully air-conditioned. Unfortunately, there is no built-in multimedia facility, so these are brought in and installed manually at the beginning of each class. This can be a time-waster as experience shows. 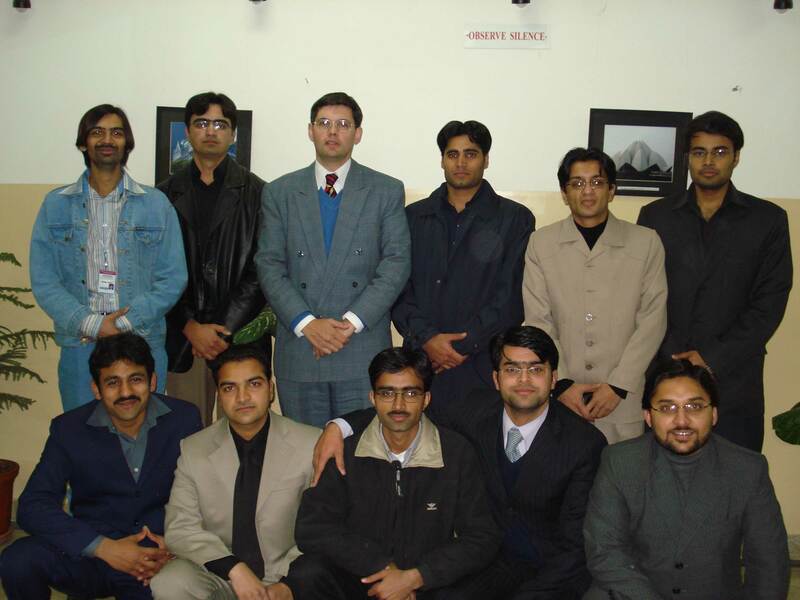 In the recently ended Fall Semester 2006, I taught project management to two MBA fourth semester classes, comprising in total some 50 students, as well as to an MS/PhD class consisting of 12 students (the enlargeable photo below shows me with some of my MBA students and was taken in the CIIT lobby in December 2006). The course material was basically the same as in the previous semester and, along with my other course material for business research methods and international human resource management, can be downloaded in in its entirety from my teaching webpage. Unfortunately, the MBA students did not perform as well in their terminal examination held on January 23, 2007, as their colleagues in spring semester 2006 did. Maybe they were less inclined to work harder this time :=( Too much absenteeism, too much boredom, too much this and too much that. A couple did achieve A-grades though. In the forthcoming Spring Semester 2007, I shall again teach project management to two MBA classes and Total Quality Management to the MS/PhD class. The enlargeable photo on the right showing me briefly addressing students was taken on the occasion of a "farewell party" which the students of MBA third semester hosted for their colleagues of MBA fourth semester on a bitterly cold December night in 2006. As a teacher of MBA fourth semester students I was cordially invited along with a few colleagues to attend. The party was held in a tent on the campus grounds. As no heaters were brought in, it was really intolerably cold! But the food brought in by the caterer was great and the dreaded "teacher parody act", in which students mimic their teachers, was a source of much laughs (I was eagerly looking forward to seeing students parody me but apparently there wasn't sufficient time). Teaching is one fundamental pillar of a Professor's work. The other, off course, is undertaking research. Time constraints have, sadly, prevented me from undertaking any meaningful research since I joined CIIT. 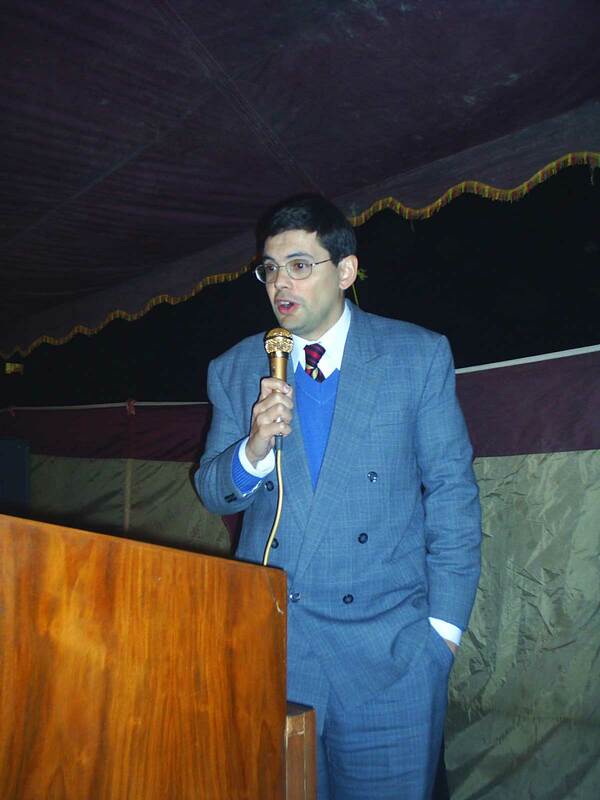 In the 1990s and in the early years of this decade, I had engaged myself in research extensively and authored a number of publications (see my research section). Nevertheless, research is always on my mind and I have given many times a serious thought to bringing out a research publication on project management practices in Pakistan. As a first step in this direction, I am presently networking with several project management professionals and public- and private-sector agencies and organizations in the Islamabad region. The scope of my work at CIIT is by no means confined to teaching only but also encompass a number of administrative tasks. Since I joined CIIT, I have been called on twice to sit in the committee to select applicants seeking admission in our MBA programme. This entailed interviewing dozens of individuals and assessing their academic credentials and, in consultation with my colleagues, deciding whether to admit or reject them. Usually the decision is quite straightforward, i.e., when the applicants have a weak academic record, as measured by their grade point averages, low NTS test scores, or when they have considerable difficulty understanding and conversing in the English language (all courses at CIIT are required to be taught in English though some colleagues have the irritating habit of conducting their classes partly in English and partly in Urdu or even in local dialects). At other times, the decision can be difficult and prudence is required. More interesting than the MBA admission committee is the MBA examination committee, the purpose of which being to conduct an oral ("Viva") examination of MBA students who have cleared all their written examinations and the additional written comprehensive examination. It is the final evaluation stage of the MBA student at CIIT. Given the large number of students enrolled in our MBA programme, and the requirement that sufficient time be given to properly test each student, this is an undertaking which can spread over days and last from morning until afternoon or evening! My experience serving several times on this committee (which, besides myself, comprises three colleagues representing the subject fields of human resource management, finance and marketing), has been partly exhilatering, partly depressing, and partly hilarious. Some examinees are bright, alert and knowledgeable, who can answer questions promptly and satisfactorily, others are bufoons and nincompoops who have hardly a clue about business administration! Usually, I ask the examinees very basic questions about general management, for instance, about the functions of management, the relationship between strategic management and project management, managerial decision-making tools, the importance of research and primary and secondary data for managers and statistical analytical tools! I also often tend to ask basic questions concerning TQM and project management, especially with regard to processes and tools and techniques used by project managers. Off course, my colleagues and me are always happy when our students perform well and no one wants to embarrass them but, in all fairness to our university and its reputation, we must ensure that they have gained enough knowledge during their four semesters at CIIT which justifies the award of an MBA degree. Most live up to this requirement, some unfortunately don't. In these few cases, the persons concerned will be required to retake the last semester. To those who successfully graduate, we wish them all the best in their future careers and hope they gain maximum benefit from their four semesters at CIIT. Another major responsibility which CIIT has entrusted to me with increasing frequency is the inspection of examinations. This entails visiting the lecture halls when examinations are in progress, enquiring whether the examinees have brought and displayed their ID and Admit Cards (both of which are mandatory), whether the invigilators have turned up for duty, whether any "untoward incidents" involving examinees and their invigilators occured, whether anyone has a complaint, and so on. The inspectoral duty usually lasts three hours. Because the examinations can extend from morning until night, three or four inspectors are usually assigned duty on any day. Immediately after the inspection, a report must be submitted to the person in-charge of examinations for that whole day. In the event that any untoward incidents did occur for which an investigation and possibly subsequent "punitive action" is called for, a small disciplinary committee is formed, headed by the person in-charge of examinations on that day and including the inspector on whose watch the incident(s) occured. Punitive action is up to the committee's discretion and can range from a simple reprimand to, in more serious cases, cancellation of a student's paper for cheating and his or her suspension for a semester. Sometimes, disciplinary action may be taken against invigilators. Given my close personal and academic relationships with Germany, I have been asked by CIIT and by my department of management sciences to pursue collaborative programmes and seek partnerships with German universities. Such institutional links can be mutually beneficial for both CIIT and the German universities. Collaborative programmes between universities typically entail a plethora of joint activities from, for example, undertaking joint research studies and bringing out joint publications, semester-wise exchange of faculty members and studies, organizing joint event activities (conferences, seminars, workshops), exchanging information on curricula and teaching and student assessment methodologies to more substantive modes of cooperation such as organizing joint degree programmes on a "twinning basis". My efforts in this regard have borne fruit. 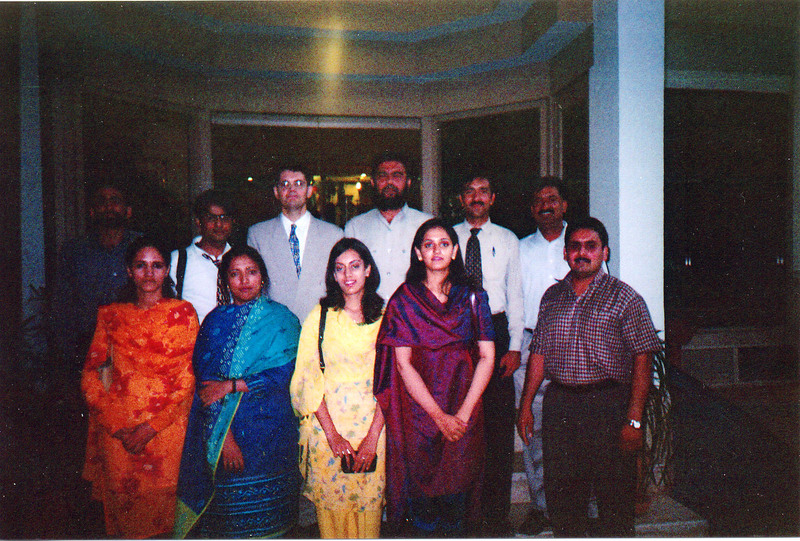 Back in Summer 2005, I met by chance the representative of a consortium of German universities (IBK-Consortium) who was in Islamabad to conduct a seminar for Pakistani students interested in enrolling in degree programmes at German universities. Like many other advanced countries with highly prized systems of higher education, Germany is seeking to attract more international students for its universities, and for which it is offering a number of attractive incentives like free or comparatively very cheap education (higher education, it may be noted, has traditionally been free to German and foreign students but this is now changing slowly and fees are being introduced) and customized programmes which are in English language thus avoiding the need to learn German. We exchanged views and agreed to work together. The IBK-Consortium is a non-profit entity with the prime objective of promoting cooperation between German and foreign universities. Based at the University of Applied Sciences in Merseburg in Eastern Germany, and comprising about 20 German universities and research institutes in an expanding network, the IBK-Consortium is managing international collaborative programmes with partners in developing countries successfully for several years now. IBK is especially active in China where it helped set up German Language Training Centres and "twinning programmes" in which a large number of Chinese students are participating. The German Language Training Centres: More than 200,000 foreign students are presently studying at German universities. In fact, Germany is one of the world’s most popular destinations or students after the USA and Great Britain. One of the main attractions of studying in Germany is, apart from the very high-quality of education being imparted at institutions of higher education there, the absence of fees for all students – both German and foreign. This generosity is virtually unrivalled in the world and is a manifestation of the egalitarian philosophy which states that education is the right of all individuals, whether from a rich or poor backgr ound. Off course, there is a cost in the sense that foreign students wanting to avail this opportunity must first learn German and also pass an admission test which tests the adequacy of their German language skills prior to enrollment. To facilitate the learning of the German language, and to make it easier for Pakistani students to enroll in undergraduate/graduate programmes at German universities, CIIT and the IBK-Consortium have agreed to set up two German Language Training Centres, one each at the CIIT campuses in Abottabad and Lahore. The Centres are expected to be operational from March 2007. The IBK-Consortium will provide and pay the salary for a native German speaker for each Centre who will impart training skills at a level which is commensurate with the requirements at German universities. 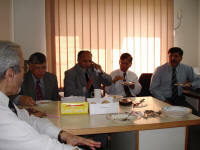 CIIT, for its part, will locate potential students from inside its campus network or from outside across Pakistan. Two German language programmes (FSP, DSH) will be offered; FSP for students with a local high school background seeking admission into an undergraduate programme in a German university, DSH for students seeking to pursue higher studies at the master- or doctoral-level at a German University. These Language Training Centres will be the first of their kind in Pakistan and offer a standard of language education which exceeds that offered by the Goethe-Institute. Presently, I am working on a feasibilty proposal (PC-1) on behalf of CIIT which will be submitted to the Higher Education Commission of Pakistan for financial support. 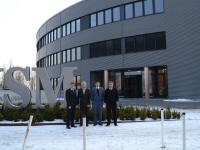 The Twinning Programmes: The purpose of the visits to the universities of Cottbus and Wildau, where my colleagues and myself were taken on an extensive tour of their outstanding and ultra-modern science and technical laboratories, was to discuss the prospects for establishing “twinning programmes” in three fields - process engineering and plant design, telematics and photonics. Such programmes, which will be open to students at the graduate level and conducted entirely in English, will be organized such, that half the two-year programme duration will be held at our CIIT Lahore campus, the remaining half at either Cottbus (process engineering and plant design, telematics) or Wildau (photonics). The entire curriculum, teaching and student asssessment methodology, and examinations, are being provided by the German partner universities and participants will be awarded their degrees by them on successful completion of their respective programmes. In the event that there is sufficient demand for these programmes, a start will be made at our Lahore campus in the Fall Semester 2007 with "process engineering and plant design", and "telematics". The "photonics" programme is scheduled to start in Spring Semester 2008. If successful, these twinning programmes will be the first of their kind in Pakistan and signify a milestone in the intensifying collaborative efforts underway between Pakistan and Germany in the field of higher education. Presently, I am also working on a feasibility proposal which will be submitted to the Higher Education Commission of Pakistan for their financial support. The German-Pakistan MBA Programme: Much of my time and effort in promoting academic cooperation with Germany has focussed on developing the German-Pakistan MBA programme. This is a joint venture between CIIT and the renowned International School of Management (ISM) in Dortmund, Germany, which is ranked as one of Germany's leading business schools. The line of communication between CIIT and the ISM was opened by the IBK-Consortium, of which ISM is a member. The four semester programme in business administration, which is conducted entirely in English, is of eighteen months duration, of which fifteen months (i.e. the first, second and fourth semesters) will be spent in Islamabad, and three months (i.e. the third semester) in Dortmund. The programme launch date is March 15th, 2007. The programme consists of twenty-five mandatory course modules and concludes with a master thesis, to be jointly supervised by a faculty member of CIIT and the ISM. The curriculum, teaching methodology, student assessment criteria and quality assurance are provided in their entirety by the ISM, whose MBA programmes are fully accredited in Germany and the European Union. On successful completion of the programme, the ISM will award the student an MBA degree in General Management. Participation in the programme is presently restricted to twenty students selected from across Pakistan who must meet stringent admission criteria in terms of their qualification and knowledge of the English language. Detailed information on the German-Pakistan MBA can be found at the official CIIT website here. The enlargeable photo on the right was taken on the occasion of my visit to the ISM on January 27th, 2006. Professor Dr. Jürgen Bode, the ISM's Coordinator of International Programmes, who attended the CIIT International Workshop on Curriculum Development and Optimization in Islamabad, is standing directly to my left. 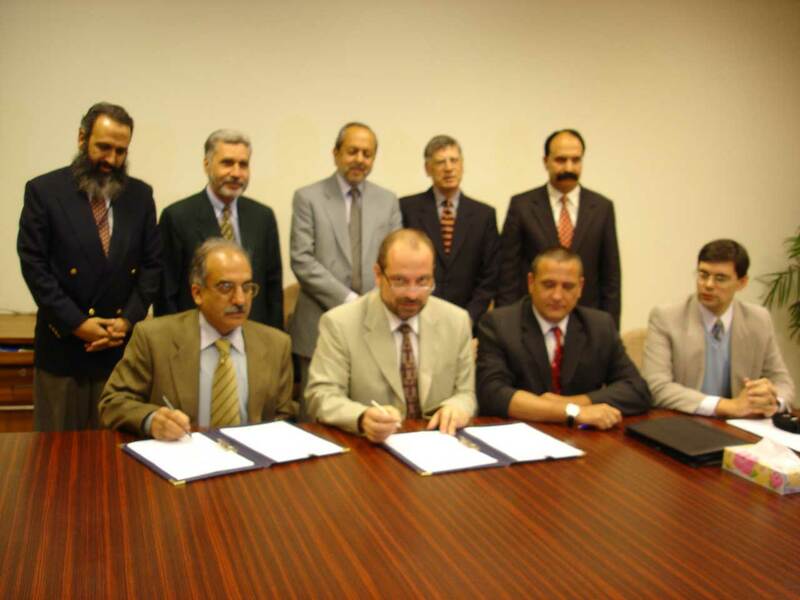 The series of 11 photographs shown above were taken on 1st December 2005 on the occasion of the signing ceremony at COMSATS Islamabad of the Memorandum on Understanding on Cooperation between COMSATS and the German IBK Consortium. 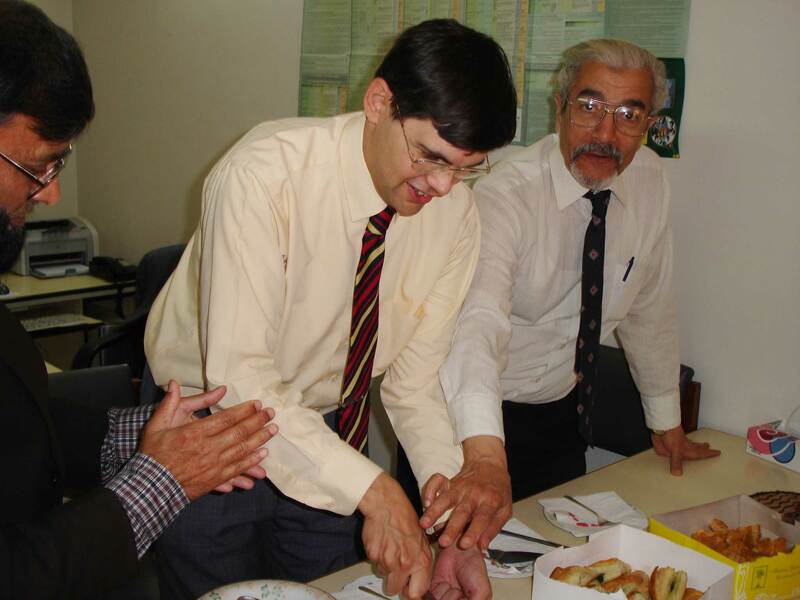 Representing IBK were its top officials Mr. Michael Rueckert and Mr. Thomas Poelte. COMSATS was represented, among other senior officials, by its Rector Dr. Junaid Zaidi and its Registrar Dr. Arshad Malik. 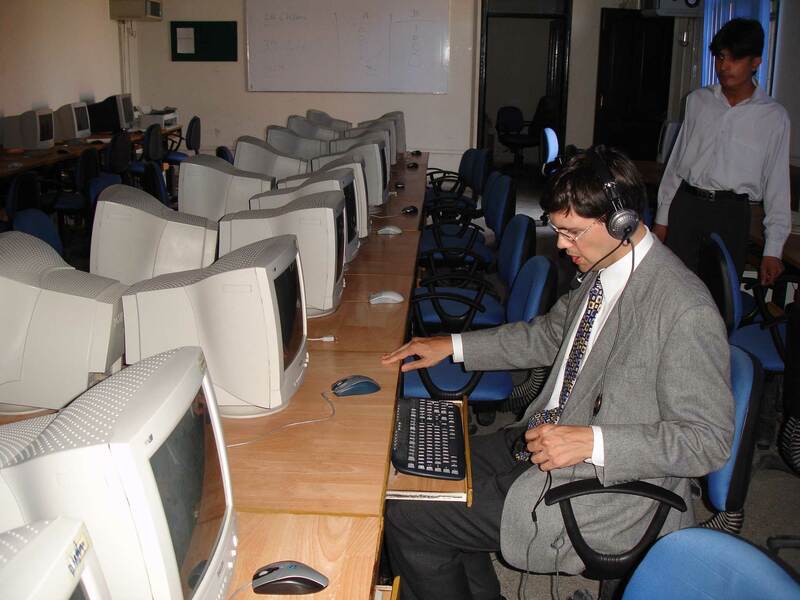 This series of 14 photographs were taken on the occasion of the visit to COMSATS Lahore campus on 30th November 2005 by Mr. Michael Rueckert and Mr. Thomas Poelte from the German IBK Consortium. The two German guests were given a guided tour of the campus and shown its facilities.The Memorandum of Understanding between COMSATS and the IBK Consortium was signed the next day in Islamabad. Lastly, and again in my capacity as Assistant Professor at CIIT, I am assisting the federal government of Pakistan with its project to establish a German Engineering University in Lahore. This university will be fully operational by 2018. A small task force for the German university has been set up by the Higher Education Commission of Pakistan and I am a member of it. This mega-project, estimated to cost around ten billion Pak. Rupees, is one of nine engineering universities that the Federal Government of Pakistan intends to set up across the country in the coming years in cooperation with technologically advanced countries which include France, Sweden, Netherlands, Austria and South Korea. My first official visit to Germany in January 2006 as part of a combined delegation encompassing my university and the Higher Education Commission of Pakistan was to lay the groundwork with our German counterparts DAAD (German Academic Exchange Service) and a consortium of prestigious German universities for this very purpose. Our task force meets periodically under the supervision of the Higher Education Commission of Pakistan’s Executive Director, Dr. Sohail Naqvi, and the task force coordinator, Dr. Ghazala Sadiq, a scientist working at the Institute of Space Technology in Islamabad. Since its inception early 2006, the task force has produced a detailed concept paper, held detailed discussions with its German counterparts on the project, and is working on a detailed feasibility study which will be submitted to the Federal Government of Pakistan around April 2007.